Whether you’re just an avid gamer, or you’ve actually come up with your own game designs, it’s easy to realize that a lot goes into designing a game. As today’s Designer Journal, Nate French talks to the card game team and asks them to share their advice for anyone with ambitions of game design! Hello and welcome to our first designer round table! Many people who play games are also aspiring game designers. What is the most valuable piece of advice you would give to an aspiring game designer? Get a pencil, get some paper, make a game. Show it to your friends and family. Go to your local game store and ask if they host design events. If they don’t, start one. Find other designers. Play their games. Have them play yours. Take notes. Listen to the things that they say are bad. Listen to the things that they say are good. Go home, get some new paper, make changes. Have no sacred cows. Change everything if you have to. Make the funnest game that you can. Caleb: Start with a clear vision. Think about what type of game you want to design before you get started. Ask yourself some important questions and write down your answers. What are the key elements of your game? What kind of experience do you want people to have when they play? How long will an average game take? The answers to these questions are your vision, and this vision will guide the entire creative process. Without a strong vision, it’s easy to get lost in the minutiae of game design. A clear vision will keep you from losing your way. Tyler: While it’s easy to say, “Make a bunch of games,” it can be much harder to actually create something from nothing. The best place to start is to take a beloved game and create a new expansion for it. Build a custom scenario or campaign for Arkham Horror: The Card Game or The Lord of the Rings: The Card Game. Make a custom A Game of Thrones: The Card Game or Legend of the Five Rings: The Card Game expansion to play with your friends. Create mechanics and statistics for a new set of miniatures for Star Wars™: Legion (you don’t have to actually make the miniatures unless you want to!) or play a game of Cosmic Encounter using aliens you created. Creating new content for an existing game, like new aliens for Cosmic Encounter, can be the perfect way to gain more experience as a game designer! There is a deep well of existing games that are fun and expandable, and these can be used as great starting points for game designers. Making content for many different styles of games also provides an easy way to learn about different game systems and mechanics: the first step into the larger world of original designs! Daniel: The best advice I can give is simply to play as many games as you can and to think critically about them. Just as reading extensively is one of the surest ways to improve your writing, playing a variety of games is a good path toward improving your design abilities. By regularly immersing yourself in different game systems, you’ll improve your sense of what good game design looks like, and what works or doesn’t work for various kinds of games. You’ll also develop a knowledge of what mechanics already exist and how they’ve been used, which you can draw on when developing your own ideas. The important part is not just to play games, but to evaluate them with a careful eye, observing how the different elements work in concert (or how they don’t work—there is a lot to be learned from failures as well as successes). Once you’ve built this pool of knowledge, you’ll be able to apply and adapt it when working on your own designs. Jeremy: Play a variety of games. In addition to card games, play board games, digital games, poker, or whatever interests you. Find out what’s appealing about those games and why. Learn to think critically about each game you play. What aspects of the game work? What aspects don't work? How would you improve the game? Having a foundation of knowledge about games helps you avoid pitfalls and provides inspiration for designing your own games. Familiarizing yourself with different games and thinking critically about them will sharpen skills that are very relevant to becoming a game designer. Brad: Don’t be afraid to fail! Have you ever had an idea for a game that never got beyond “just an idea?” So many designs die before they even make it to prototype, and often, it’s simply because the designer fears their idea won’t work or won’t be fun. Making a game is like running a series of experiments; you keep changing the variables and you’re always figuring out things that don’t work! Don’t despair when your game falls flat. A mechanic that isn’t working can be fixed or changed. Just follow where the fun parts in your design take you. Try and see every failure not as a sign that your ideas are bad, but as an opportunity to learn something about your game and to continue growing as a game designer. Matthew: My advice is: get involved in your gaming community! This is a great way to dabble in game design and get your name out there in the process. 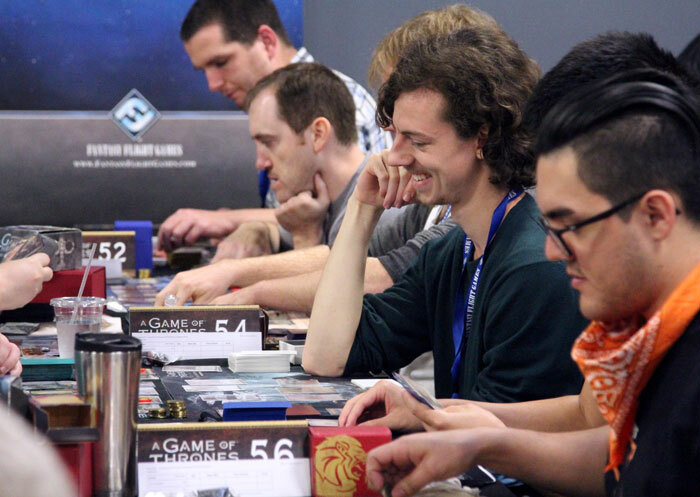 Participate in tournaments for your favorite competitive LCG®. Organize special events at your local gaming store. Take part in discussions about your favorite card game online. You could even create your own kind of content for your favorite LCG, be it recorded playthroughs on YouTube, blog articles, or podcast-style discussions! In addition to helping the community for your favorite game, you’ll also gain a deeper understanding of how a broad variety of different people relate to and experience games. This awareness is invaluable to game designers and will help you as you craft your own games. Aaron: I designed three complete games before I got my fourth published. Even though I felt like I finally had a game that could succeed, it was still an uphill battle to get people to pay any attention to it. I was working full time while devoting all my free time to the game, traveling the convention circuit, demoing the game to anyone who would stop long enough to endure my pitch. Breaking into this industry requires a lot of hard work. Of course, if you are truly made for this kind of job, it will hardly feel like work at all. I applied at Fantasy Flight Games six times and didn’t make the cut before I finally got hired on my seventh try. It took over a year, but I kept trying, because I knew this was the perfect job for me. The key is to keep trying, to keep learning as you go, and to get a little closer every time. It’s easy for dreams to remain just dreams. The more we get into the habit of thinking about doing something or telling people that we’re going to do something, ironically, the less likely we are to actually do that thing. Don’t wait for the universe’s permission to create the thing that you want to create. Just start making it. Get into the habit of doing, and your skill will naturally grow over time. Eventually you might even be designing the kind of games that people will pay for! We hope that you enjoyed this edition of the Designer Journal and that some of the aspiring game designers out there find the advice helpful. Until next time, good luck and happy shuffling!